Kate is "nearly" a Maine native. Born in Johnson City, New York. 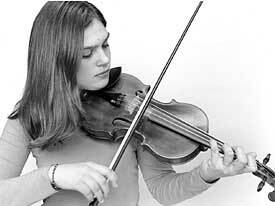 Kate began playing the fiddle with the Suzuki method at age three from fiddle instructor Win Pusey. Throughout school, Kate took classical lessons. Her love of traditional-fiddle music began when Kate was twelve. She played in the Rangeley Fiddle Festival and discovered the joy of an audience clapping and dancing to her music. At sixteen, she traveled to Ireland where she readily joined in her first real pub music session. Kate has won fiddle contest awards, attended fiddle camps and played with some of the best fiddlers in Maine. In 2000 Kate joined the Green Mountain Railway contra dance band where she quickly began to develop a following of dancers and music fans. In 2003, Kate studied music in Cape Breton at the Ceilidh Trail music school with Buddy McMaster, Joe Cormier, J.P. Cormier, and Brenda Stubbert. The following year (2004), Kate traveled again to Ireland where she studied music with County Clare fiddler master, Pat O'Conner and had the opportunity to play with some of Ireland's best. Driven by a passion for music, Kate is now actively composing music and is a major influence in Maine's rich traditional music scene. Her musical style combines the traditions of Cape Breton, Ireland, Scottland, and Appalachia with her own unique approach that that has been described as "tantalizingly familiar, yet uniquely Kate!" Kate's two albums (with Chuck Donnelly), After Sunset and These Three Shores, released on Standing Stone Records, are available online at CD Baby and at select music stores and clubs. Kate now performs in a fiddle/guitar duo with Chuck Donnelly. Kate's fiddle was handmade by one of Maine's renowned violin makers, Robert S. Beacham. Chuck Donnelly developed his interest in traditional music forms while living in the San Francisco Bay Area. Chuck played guitar in the Bay-Area Bluegrass session music scene for several years. In 1996, he moved to Maine where he and his wife, Janet, promoted music at the Left Bank Cafe in Blue Hill for two years. Chuck developed a passion for Celtic music while playing contra dance music with the Green Mountain Railway band. Chuck has traveled to Ireland and attended music school in Cape Breton to learn more about the roots of Celtic music. 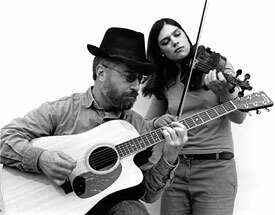 He has been playing guitar with Kate Wegner since early 2000 and is now actively performing around the country with Kate in a fiddle/guitar duo. His passion for Celtic music comes across in his percussive rhythms and fast melodies on After Sunset and These Three Shores, two albums by Kate Wegner and Chuck Donnelly.